The Park is home to over 50 businesses and 1,500 jobs. City owned industrial property is priced at $30,000 per acre less price reduction incentive credits that are calculated and awarded three years after closing date. Incentives are based on the number of jobs created and real estate improvements completed on the subject property. The City offers incentive financing on the purchase of industrial park land. Sales are subject to the following terms: $10,000 per acre down payment, 3-year term, 0% interest. Jobs creation credits of $4,000/job for each new full time equivalent (FTE) position that pays at least $15.00/hr, exclusive of benefits. Real Estate Investment Credit of $4,000 for each $100,000 in real estate improvements. Other available City incentives include low-interest Revolving Loan Funds. 5 Quarterdeck Marina (storage) 6 Portside Builders, Inc.
17 N.E.W. Industries, Inc. 18 Sunshine House, Inc.
19 Marine Travelift, Inc. 20 Therma-Tron-X, Inc.
21 Therma-Tron-X (Expansion Land) 22 Cadence, Inc.
27 Cochart Tire 28 C&S Manufacturing Corp.
29 Peninsula Creations 30 Hatco Corp.
37 Warner-Wexel, LLC 38 Master Tool Company, Inc.
41 City of Sturgeon Bay – AVAILABLE 42 HTF, Inc.
43 Linen Press 44 Key Industrial Plastics, Inc.
45 Bay Electric Systems 46 Wiretech Fabricators, Inc.
Review the complete Industrial Park Land Acquisition Manual. 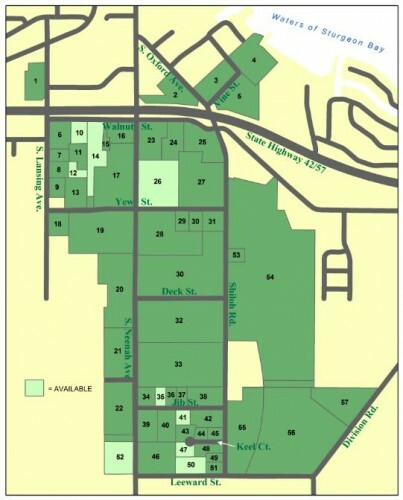 Review the Industrial Park Zoning Code. View a list of sizes and prices for available Industrial Park lots. To assist business owners with expansion projects, Wisconsin Public Service has compiled information and renderings of common building types in business and industrial parks in Wisconsin. This proposal includes floor plans, time-tables and construction costs for conventional and pre-engineered buildings. PeaPod Homes Wins in Statewide Competition!